The threat of summer showers failed to discourage Immokalee farmworkers and their families to team up with committed allies of the Greater Orlando community for a high-energy march, cranking up the heat on the Wendy’s and Publix campaign in Central Florida. 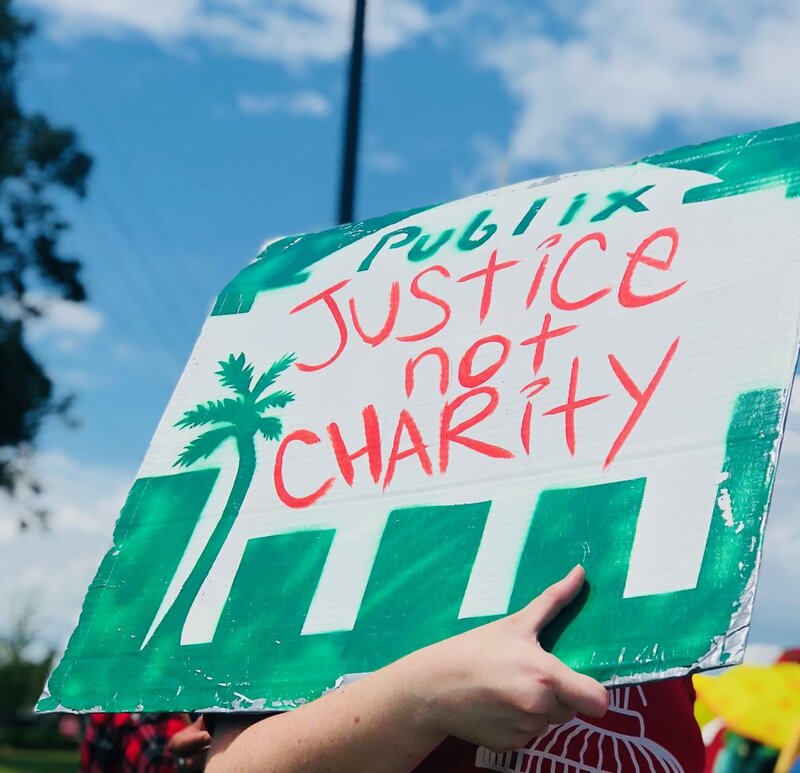 On Sunday, a crowd of over 75 gathered in South Semoran to deliver an undeniable message to Publix and Wendy’s: human rights protections for farmworkers are possible thanks to the Fair Food Program, and consumers of the 21st century will settle for nothing less! As the Florida Summer of Action surges on, picking up steam from sister protests throughout the state, the Orlando community surely left its mark on the campaign trail. The Rev. 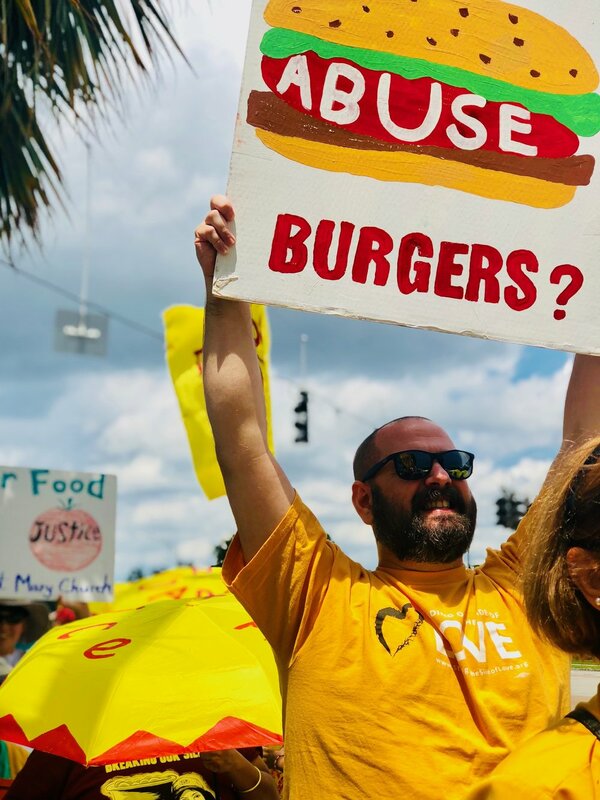 Kathy Schmitz addresses a crowd of over 70 Fair Food supporters in a spirited march in Orlando, FL on August 12, 2018. Wearing their signature, bright yellow T-shirts, members of First Unitarian Church of Orlando, including the Rev. Kathy Schmitz, took up the Fair Food banner alongside CIW. The Youth and Young Adult (YAYA) Network of the National Farmworker Ministry and the Orlando Democratic Socialists of America made a presence, too. The beautiful multi-generational action, consisting of grandparents and young children, students and religious leaders, made it clear to Publix and Wendy’s that conscious consumers won’t budge until they sign a Fair Food Agreement to guarantee farmworkers’ fundamental human rights! Soon after, the protest took off to Publix! The Florida-based grocery giant has ignored the urgent call, by tens of thousands of farmworkers and consumers in their home state, to join the Presidential Medal-winning Fair Food Program for nearly a decade now. As the action wrapped up, the Fair Food delegation shared about their exchange with the representatives deployed by Publix to save corporate face at the public demonstration, who repeated Publix’s same tired excuses for rejecting the Fair Food Program. The spokespeople for Publix and Wendy’s social responsibility issues have made a profession out of denying both the reality of farmworkers’ exploitation and corporations’ undeniable obligation to consumers for ensuring freedom from abuse and discrimination in their supply chains. Stay tuned as the Florida Summer of Action continues its trek through the Sunshine State. Next up: Miami!